The basic story behind Hay Day is that your uncle has, unfortunately, decided to retire. We say unfortunately but if he wasn't then there'd be no farm for you to inherit, so this cloud has a silver-lining. Your initial plot of land contains just a house, a barn, and a silo. The ground itself is littered with trees and rocks, which makes it seem like an unlikely spot for a fertile farm, but that's before you get to work on it. As you may have gathered, the plot to the game involves you upgrading the farm and making into a fruitful, money-making business. 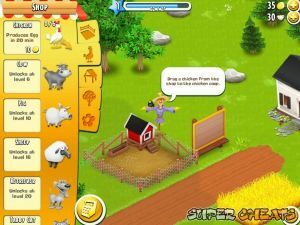 The game allows you to clear land, buy new buildings, animals, crops and generally everything you would expect when it comes to the life of a farmer. Hay Day features two distinct types of currency. These are Diamond and Coins. Each has its own use, though Diamonds are considerably more valuable than the everyday, run-of-the-mill Coins. How to cheats coin and diamond?? I have had no problems with Hay Day so far. Can I move crops and building? If so how? I was saving my land deeds to add on to my farm and they disappeared. How does that happen? Anything I can do to find them? There is a abandon farm. Is there any to collect any of the things there.